TD Ameritrade offers thinkorswim trading platform. It is widely considered as one of the best online brokerages. This stock broker provides several asset classes for trading such as stocks, mutual funds, bonds, futures, options, Forex, and ETFs. TD Ameritrade offers commission-free ETFs. This firm also has commission per trade of $9.99. This broker also has one of the best website and mobile apps. Fidelity Investments is well known among investors or traders. It is considered as a big name in brokerage. While it is best known for serving long-term investors, the firm has made recent attempts to appeal more active traders. Fidelity also offers all customers a wide selection of investments, including more than 75 commission-free ETFs and international stocks. Fidelity also offers some of the most extensive research resources for many stocks. Considered to have the fastest trade execution, it has a commission fee of $8.99 per trade. You also has an access to check writing, 24/7 Customer Service, and debit card. Merrill Edge is part of Bank of America. It tailors mainly to long-term investors. This Merrill Edge provides variety of investment selections. You can link your banking account with your investment account. It also offers IRAs for free. If you have $100,000 or more in your combined Bank of America and Merrill Edge accounts or Platinum members, you are eligible to receive 100 free trades per month. This firm also offers free research reports, analysis software, and low account minimum. OptionsHouse is founded in 2005. 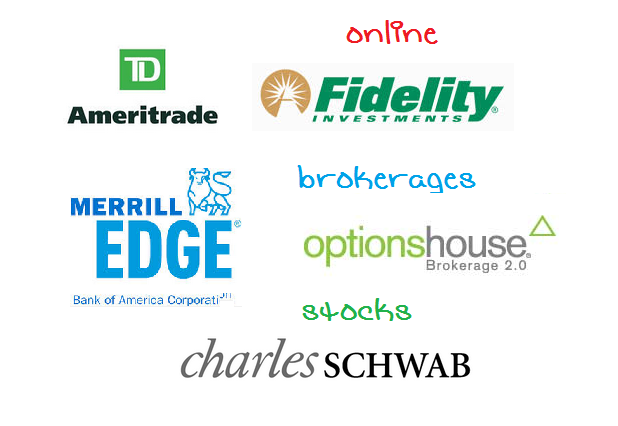 OptionsHouse also offers very reasonable commission rates for trading stocks or options. The firm charges $4.95 for up to five contracts, and $0.50 for each additional contract. High-volume traders can opt for an alternate plan which charges $8.50, plus $ .15 a contract for single-leg orders. OptionHouse has no minimum initial deposit, or maintenance fees. It is considered to have one of the best option trading platforms. This online brokerage doesn’t offer free ETF trading. You can buy and sell stocks, mutual funds, bonds, futures, options, and ETFs. Charles Schwab is one of the first discount brokerage. Schwab offers more than 10,000 mutual funds and over a hundred commission-free ETFs. It also provides banking services. Customers can visit one of over 300 branch offices. Schwab One Brokerage Account provides services to trade stocks, mutual funds, bonds, options, and ETFs. You can’t trade futures, and Forex. You can use your smartphone to access your account using mobile app. It also offers research report. You can trade stock for $8.95 per trade.